The CS:GO PGL Major in Kraków is starting in mid of July. It is already the third major happening and with a price-pool of $1,000,000 one of the biggest CS:GO tournaments. 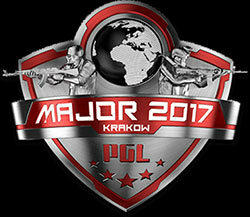 At the PGL Major Kraków a lot of top teams are facing one another. This will make for an entertaining tournament for us viewers and fans. 16 teams are participating, half of those are automatically qualified as they placed in the top 8 at the last major, earning them the “legend” status. 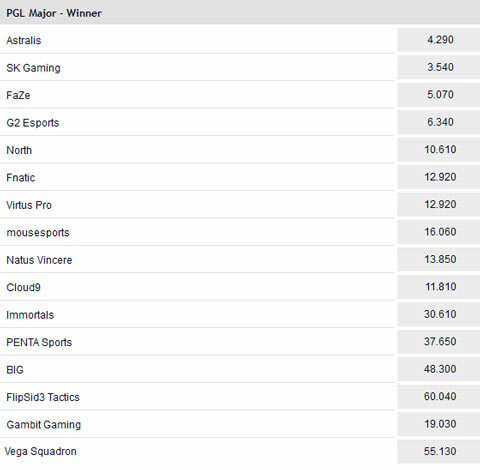 The remaining 8 teams are so called “challengers” as they came through the qualifiers to earn their spot at the PGL Major Kraków. The tournament follows the same format as the ESL One in Cologne with a Swiss group in the beginning to determine the 8 teams participating in the playoffs. The TAURON Arena in Kraków is the location for the PGL Major. Location: TAURON Arena, Kraków, Poland. You already know who will win? The PGL Major in Kraków will feature a Swiss style group in the beginning. This means all teams will be placed in one group with set matchups in the beginning. From then onward only teams with the same results will play each other. So winners are going up against winners, and defeated teams go up against another defeated team. After round three there will be teams with 3 wins, which means they automatically qualify as the first teams for the playoffs. On the other hand, the teams with 3 losses will be eliminated from the tournament. This system continues until there are 8 teams participating in the playoffs. Gambit Esports: Dosia, AdreN, mou, Zeus, HObbit. North: MSL, k0nfig, cajung, Magisk, aizy, ruggah. mousesports: chrisJ, denis, oskar, loWel, ropz. PENTA Sports: kRYSTAL, suNny, HS, innocent, zehN. Vega Squadron: mir, chopper, jR, Keshandr, hutji. FlipSid3 Tactics: B1ad3, Worldedit, markeloff, wayLander. BIG: gob b, LEGIJA, tabseN, nex, keev. With the tournament upon us, the esports bettings have started to release their bets and odds. 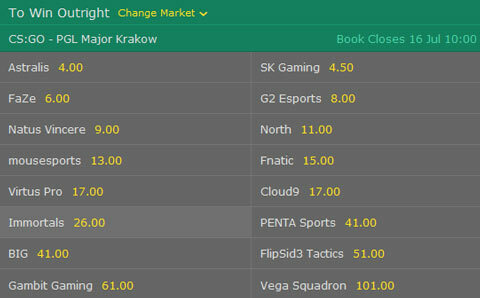 Especcially bet365 has a lot of additional special bets, which we will cover on our detailed site about betting on the PGL Major Kraków in CS:GO. 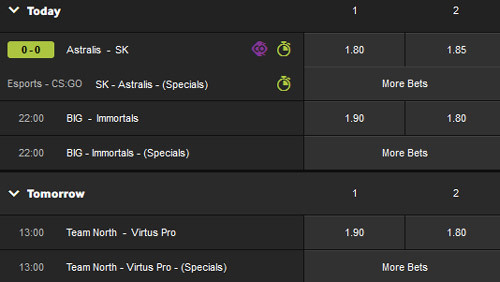 It is interesting to see the esports betting sites rank the individual teams. There are some difference between the two different odds. More information about betting on CS:GO here.